Serious Health Risk For River Users? The Health Protection Agency this week published a report on the cleanliness of the tidal Thames and how safe it is for those who use the river for leisure activities. The report entitled ‘The Thames Recreational Users Study’ was created by the City of London, London Port Health Authority and the Health Protection Agency. Their aim was to evaluate the risk to river users and to ascertain whether there was an increased risk of ill health to users following water contact associated with rowing and canoeing. The study also set out to determine whether information gained from long term microbiological monitoring could predict the duration of poor water quality following rainfall and provide information on any risk to users. Some of their findings make worrying reading for those who use the Thames for recreational activities. Evidence that concentrations of microbiological organisms exceed the World Health Organisation (WHO) recommended levels for recreational use was found at Kew, Barnes and Putney. It was also found that less than 1% of days when water samples were taken from the Thames’ tideway were deemed acceptable by the WHO guidelines and that frequent contamination of harmful bacteria including salmonella was present in these samples. However, it’s not all bad news. 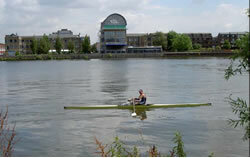 The introduction of interventions such as the “Thames Bubbler” (a method of directly introducing oxygen to the river to increase levels), the collection of floating flotsam and jetsam and improvements to sewage treatment works in the Thames tideway has resulted in some improvements to river quality.